The iGEM wiki is frozen. Edits to the wiki have been disabled so that the judges and iGEM headquarters can organize and begin evaluations. Next-step: get ready to come to a great Jamboree at MIT. Wiki freeze is tonight! All of your documentation must be completed by Wednesday October 29 at 11:59pm EST on the iGEM wiki. See the Requirements for details. The sign-up sheet for practice presentation slots is up. Sign up if you want to practice your presentation on Friday night! The Jamboree page is constantly being updated. Make sure to check it out often for more detailed Jamboree information. Alums: Volunteer for the Jamboree! Others are welcome as well -- see the Volunteer page for details. Please send us your project abstracts by October 8!!. Make sure to submit a request for variance if your team is using a non-BioBrick standard method. See the Judging page for more details. 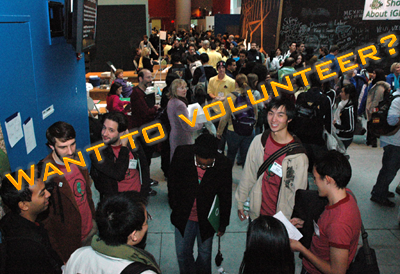 Time to register for the iGEM 2008 Jamboree! All iGEM participants are highly encouraged to come to the Championship Jamboree on November 8-9. If you have not done so already, make sure to book your hotel room and make travel plans. Keep in mind the iGEM workshops on Sunday evening and the newly announced Biobricks Foundation meeting on Monday morning. See the weekend's schedule for more details. We will be providing more information on Jamboree requirements such as how to send your parts to us soon. Join a committee to help plan the Jamboree social event, work on safety in iGEM, or more. And don't forget to make your team t-shirts!